Is College Basketball's 'Dome Effect' Real? Teams shoot slightly worse and score less in dome-centers than in other venues, but they also play against better defenses. The average defense playing in a standard arena has a full-season opponent field goal percentage (OppFG%) of 40.7% and a points-against average of 63.5 points. This compares to 40.4% and 63.2 in dome-corners and 40.2% and 62.5 in dome-centers (highlighted in red below). ​Statistically, it's no coincidence (or surprise) that teams shoot worse and score less against better defenses. 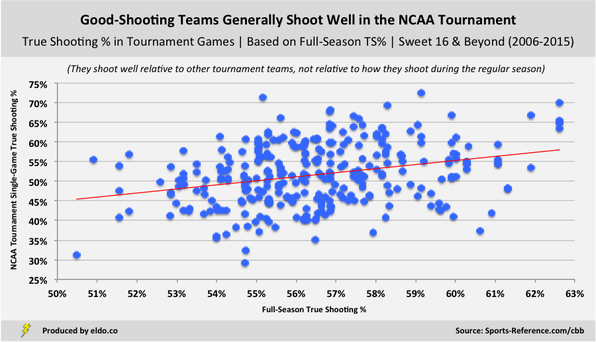 When considering a team’s true shooting percentage (TS%) in a late-round NCAA tournament game, their full-season TS% and the other team’s full-season OppFG% are significant. When considering a team’s change in TS% in a late-round NCAA tournament game relative to their season average, the other team’s full-season OppFG% is significant. 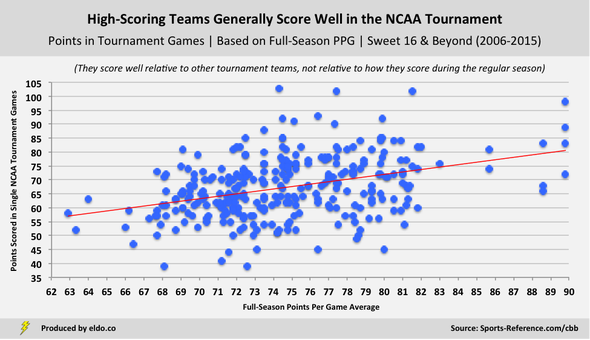 ​Likewise, when considering a team’s point total in a late-round NCAA tournament game, their full-season points per game (PPG) average and the other team’s full-season PPG allowed are significant. When considering a team’s change in point total in a late-round NCAA tournament game relative to their season average, the other team’s full-season PPG allowed is significant. ​Note that while the aforementioned variables and trends are significant, the data is noisy and highly variable around that trend. None of the models I've run explain much of the variance around the trend or offer much in the way of predictive power. They simply indicate that real relationships exist, which is more than can be said of venue type. We've gone down a few rabbit holes, controlled for a bunch of factors, and will keep exploring throughout March Madness, but venue type does not appear to have a statistically significant effect on shooting or scoring in the NCAA tournament. Next: What about specific venues and this year's Final Four at NRG Stadium? II. How do teams perform in different NCAA tournament venue types? III. How does that performance compare to their season averages? V. What about specific venues and this year's Final Four at NRG Stadium? This analysis uses True Shooting % and average performance, weighting each game equally regardless of how many shots were taken. For FiveThirtyEight and my 2017 update, I used Effective FG% and aggregate performance, calculating shooting percentages based on all shots taken and made (shots equally weighted). The takeaways are the same with either methodology. See Part V for a postscript on further reading, overtime, defensive metrics, and how I calculated changes in performance relative to teams' season averages. ​﻿﻿The data source for this article is sports-reference.com/cbb. Data was compiled and analyzed by ELDORADO. All charts and graphics herein were created by ELDORADO.